Just install it on the both front and back wheels. Making your bike become the most attractive and dazzling! Who's Got The Coolest Bike spokes? That would be your child, if you decide to get them this 144pcs spokes and clips set! No girls will say no to adding a unique dash of pizazz to their favorite bike with cute and beautiful decorations! Not All Bicycle Are Created Equal - Make Sure You Get the Best! Forget about your old, flimsy bike wheel spokes decorations that only lasted for a few rides. They're so easy to attach that all you need to do is snap them on your front or back wheels and you're ready to go! Made of top-quality plastic material, these clips were designed to stay put no matter what. Being fully waterproof and sun proof, they will stay on your kid's bike until they outgrow it! This multi-colored spoke beads and clips set is suitable for kids bicycle. Choose one or some and decorate your bike now! DECORATE YOUR BIKE: Whether for kids or adults, this spokes decoration kit will make an excellent way to accessorize your bikes, adding pleasure to your riding trip without much effort. CONVENIENT DESIGN: With an easy, clip-on design, these multicolor bike spokes decorations can be installed in one motion. Simply snap them on your bicycle spokes and transform your wheels in seconds! WATERPROOF & SUNPROOF: Made of quality plastic material, these girly bicycle clips were designed to stay put once installed the wheels! Sun or rain, snow or wind, they were simply made to provide you with a long-lasting and fun experience. 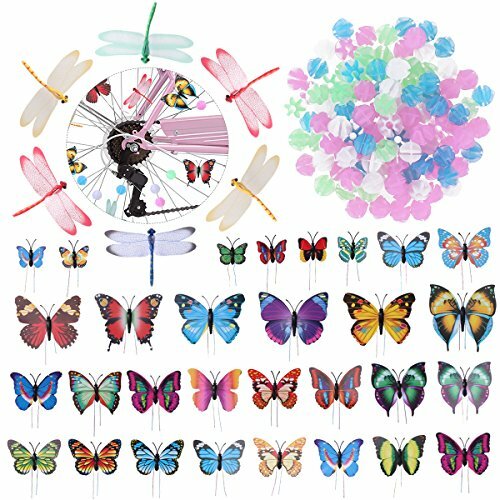 VARIETY OF STYLES: There are a total of 30 different styles of butterflies clips, 6 Dragonflies Clips and 108 Wheel Spoke Beads. Try to mix these and match these dazzling to create the most attractive, girly bike wheels. GREAT GIFT SELECTION: This is the greatest gift for your child or friends that who likes ride the bike.